To celebrate 27 years making high quality test equipment we have introduced a new 5 Year Guarantee. From the start of June 2015 many Banair testers will be guaranteed for a full Five Years. All Banair test systems are engineered and constructed for continual high performance in normal commercial use. If a Banair test system is used in the way it is intended (see instructions for use) and it breaks down within the guarantee period, it's our responsibility to repair or replace it. Repair or, at its option, replace without cost either for material or labour any part of the Product which is found to be defective within FIVE YEARS of the date of purchase. What does the Banair 5-Year Guarantee cover? Our Banair guarantee covers the repair or replacement (at Banair’s discretion) of your Banair test system if it is found to be defective due to faulty materials or workmanship within the guarantee period. That includes all parts and labour needed to get the test system working properly again for free, with no quibbles. If any part is no longer available Banair will replace it with a functional replacement part. What’s not covered by your Banair 5-Year Guarantee? Normal wear and tear, including parts that might wear out over time (e.g. fuse, connectors, batteries, filters, pneumatic cylinders, etc.). Deliberate or unintentional wrong use (see instructions for use), inappropriate use or alterations to the product. Normal recommended maintenance as set out in the Product’s Instruction Manual. Repairs when the equipment has been dismantled, repaired or serviced by anyone other than Banair. Inappropriate storage, use under extreme conditions. External force (such as caused by a fall or jolt), sand, dirt, liquids or inappropriate handling in transport - Wear and tear caused by extraordinarily frequent but otherwise proper use. Service calls to which are not related to any defect in the Product. The cost of a service call will be charged if the problem is not found to be a Product fault. -	Instructing you how to use the product. -	Correcting fault(s) caused by the user. -	Use of parts not assembled or installed in accordance with the instructions of Banair. -	Use of parts and accessories which are not Banair approved. -	Faulty assembly or installation (except where carried out by Banair). -	Repairs or alterations carried out by parties other than Banair.. If you have any questions about what a Banair guarantee covers, we'll be happy to help. You can call us on +44 (0)23 8032 4334. 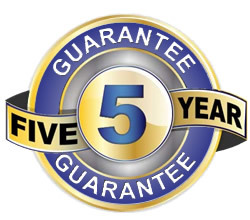 The guarantee is valid for five years from the date of purchase of the product. The date of the receipt shall be deemed date of purchase. You must provide proof of delivery / purchase before any work can be carried out on your test system under the guarantee. Please note that without this proof any work carried out will be chargeable. Please keep your purchase receipt or delivery note. All work will be carried out by Banair. Replaced product/parts will become the property of Banair and not be returned to the customer. The warranty expires if the product serial number is removed or defaced beyond recognition. If you have any questions, you can call us on +44 (0)23 8032 4334. A Banair guarantee becomes effective on the date of purchase or delivery of your machine, whichever is later. In the event of there being a defect within the meaning of these guarantee terms, Banair will - free of charge – either repair the defect or replace the defective product, such replacement product being either of the same production series or a comparable successor product. To make a claim under the guarantee, the customer must first contact Banair and obtain a RMA number before sending the product to Banair. The warranty claim will be processed and satisfied exclusively by Banair. The product must be accompanied by a copy of the receipt as proof of purchase, and a description of the defect which should be as detailed as possible. The product must be sent all postage paid. The customer agrees to arrange, at his own expense, for adequate insurance and packaging. Should the examination of the customer’s complaint reveal that there is no liability under the guarantee; Banair will provide an estimate of the likely cost of repair. The guarantee is not capable of transfer or assignment. Under the terms of this guarantee, no relief can be claimed beyond repair and, where appropriate, supply of a replacement product and any claim for such further relief, in particular compensation for consequential loss or damage, such as loss of earnings, replacement batteries, is expressly excluded hereby. Should individual provisions of these terms be partly or wholly invalid or inoperative or subsequently become invalid or inoperative in consequence of a change of the applicable law, the remaining terms and their validity shall not in any way be thereby affected.